Welcome to the first installment of the NFL Bottom Of The Barrel. Each week, myself and fellow We Got This Covered writer Dave Gilbert will take a look at who we think are the best and worst NFL teams of the week. We will alternate each week starting with me looking at the bottom three and Dave picking the top three. The Vikings have the misfortune of playing in the NFC North, which should be one of the tougher divisions in the NFC. The Green Bay Packers and Detroit Lions were both in the playoffs last year, and the Chicago Bears are much improved. The Vikes have a sketchy defense at best and the offense will be led by 2nd year pro Christian Ponder. The O does have a few good skill position players, but it all hinges on if Adrian Peterson can bounce back 100% from his injury. If he’s the Peterson of old, that alone will be enough to get Minnesota a few wins this year. I think HBO chronicling the Miami Dolphins preseason on Hard Knocks will be the highlight of the year for ‘Fins fans. New head coach and offensive guru Joe Philbin will have a tough job piecing together an offense that will score enough points to offset a middle of the pack defense with questions in the secondary. They are clearly looking towards the future with their roster. They traded away their best receiver in the off season, they moved one of their top defensive backs recently and they also traded away some offensive line depth. It’ll be up to their running game to take some pressure off rookie QB Ryan Tannehill, but with no legit #1 or #2 receiver on the roster, he’ll have a tough go of it. The Browns are in full rebuild mode. They hope to have drafted their future with QB Brandon Weeden, RB Trent Richardson, and WR Josh Gordon, but relying on 3 young guys to lead an offense is a recipe for disaster. If they can develop like the Browns hope, expect them to be competitive next year. Weeden will have the usual rookie QB growing pains, even though he’s a mature 28. Richardson is coming off knee surgery and he may have a slow start to the season. But once he’s full go expect the Browns to lean on him heavily. And Gordon will need to grow up a bit as a pro. He’s inexperienced as a football player and he has three positive tests for marijuana in his recent past, but the talent is there. 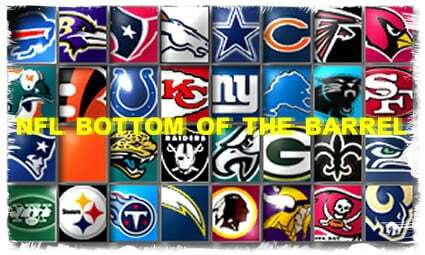 Be sure to check out my colleague Dave Gilbert’s “NFL Cream Of The Crop” to see who he believes are the 3 best teams in the NFL. Then, stop by We Got This Covered next week to see us flip assignments.